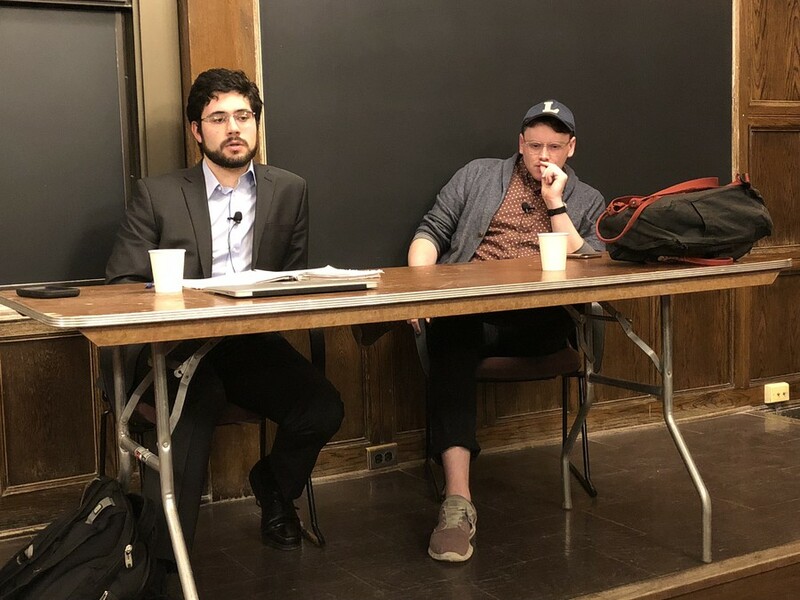 Anti-deportation activist Sean McElwee was on campus this week for a debate at the University of Chicago Political Union. Sean McElwee, the writer and cofounder of left-wing think tank Data for Progress, better known by his Twitter handle, we’re going to abolish ICE, was on campus Monday to speak at the University of Chicago Political Union (UCPU) about the movement to dissolve U.S. Immigration and Customs Enforcement (ICE). McElwee said he came to UChicago because UCPU offered to pay for his flight—and because he wanted to see his family, who live in Wisconsin, over Thanksgiving. At the debate, which was livestreamed, he faced off against third-year Eugene Miravete, a member of College Republicans. McElwee sat down with The Maroon before the debate to discuss his vision for ending mass deportation, getting rid of ICE, creating an ethical immigration policy, and building a bold left flank of the Democratic party. Since McElwee first tweeted #AbolishICE in February 2017, he has become the public face of the movement, appearing frequently with politicians and pundits in a black T-shirt with the slogan printed in bold. The proceeds from the sale of the shirts are directed to immigration activists. Initially written off by mainstream media outlets as a fringe proposal, #AbolishICE started drawing attention as left-wing primary challengers in the 2018 midterm elections endorsed the movement. Alexandria Ocasio-Cortez, who gained national attention following her upset victory over a top House Democrat, made the hashtag a key plank in her platform. McElwee attributes the power of #AbolishICE to it being a strong, uncompromising demand from the left. This past summer, building on national attention on family separations at the U.S.–Mexico border under Attorney General Jeff Sessions’s “zero tolerance” policy, the House Progressive Caucus introduced a bill to abolish ICE. The proposal has since become a litmus test on the left, with prominent senators Elizabeth Warren and Kirsten Gillibrand expressing their support. The movement is currently focused on “disentangling” ICE from local policing and law enforcement and, more broadly, creating cultural norms against mass deportation. Refuting critics of “tribalism,” who suggest that too much focus on diversity markers like race and gender leads to political fragmentation rather than coalition-building, McElwee maintains that “identity politics” remain an important tool for mobilizing class-conscious leftism. Countering the “Bernie Bro” narrative, which suggests support for leftists is strongest among educated whites, McElwee insisted that “descriptive representation”—voting for candidates with diverse identities—is both an important aim in itself and a good heuristic for worker-friendly economic populism. “If you actually look at who in the Democratic base is most ready for socialism—most ready for super anticapitalist politics—it’s not rural non-college whites,” he said. McElwee said he views arguments on the “labor left”—such as the claim that immigrants consume social services that could otherwise flow to American workers—as a kind of exclusionary “labor chauvinism,” focusing only on workers with documentation. Though Democrats of all stripes—Third Way to leftist—are already gloomily forecasting a Democratic defeat in 2020, McElwee believes Trump will be unseated by a Democrat. His frequent informal wagers on 2018 midterm outcomes were largely correct, and McElwee says he’s considering staking his reputation on his prediction that the president will lose. “I bet my career on Democrats taking the House. I mean, it would be a very effective way for white men to step back, really—to just bet their career as frequently as they can, and eventually you’ll lose just based on the numbers,” he quipped. McElwee thinks local elections will “be an increasingly important nexus of political activity” as gridlock at the federal level becomes more common. To that end, he said contesting sheriff, district attorney, and state legislative races will be key to future leftist movements. And, following #AbolishICE’s success in shifting consensus about deportation leftward, McElwee is already considering more campaigns to expand the left flank of the Democratic party. The next big issue for the left, he predicted, will be “something along the lines of the Green New Deal,” because it eliminates a major Republican attack on climate policy: that solving climate change will hurt job prospects for working-class Americans.